Zechariah is a book filled with visions and oracles of divinely-permitted judgments against evil in Israel and Judah, finally becoming a metaphor for the end of the “world.” Within its complex messages are strands of hope that deliverance from trouble and conflict will come to the oppressed saints, innocently immersed in this time. “Take away the filthy garments from him. And unto him he said, Behold, I have caused thine iniquity to pass from thee, and I will clothe thee with change of raiment” (Zechariah 3:4b). Those solemn warnings and promises are a template of God’s intentions as we near the eschaton. Zechariah ends with the glories of a restored future, addressing the cravings of all “prisoners of hope” (Zechariah 9:12a). The Bible is filled with purpose-driven sagas of tribulation and deliverance. They are polarizing events which separate the loyal from the imposter. Daniel gave a deliverance prophecy while in Babylonian captivity. It was timed to be fulfilled when the eschatological antichrist was defeated (Daniel 11:45) and following that great tribulation. Joel also said: “And it shall come to pass, that whosoever shall call on the name of the LORD shall be delivered: for in mount Zion and in Jerusalem shall be deliverance, as the LORD hath said, and in the remnant whom the LORD shall call” (Joel 2:32). Deliverance comes to those within God’s true church, where His presence resides. Of special significance are the celestial events associated with this time. They herald the coming of Christ and act as final signs of hope to God’s people right after that tribulation (Matthew 24:29-30). This “global tribulation” or “great tribulation” is a terminal event – known also as “Jacob’s Trouble” in prophetic history. There are, however, other important Biblical times of trouble related to the eschaton! Christ’s treatise also gives the sequence of those end-time events. Note once again that the celestial signs follow the great tribulation, and immediately precede Christ’s coming, as Joel also suggested (2:10-11, 3:14-15). 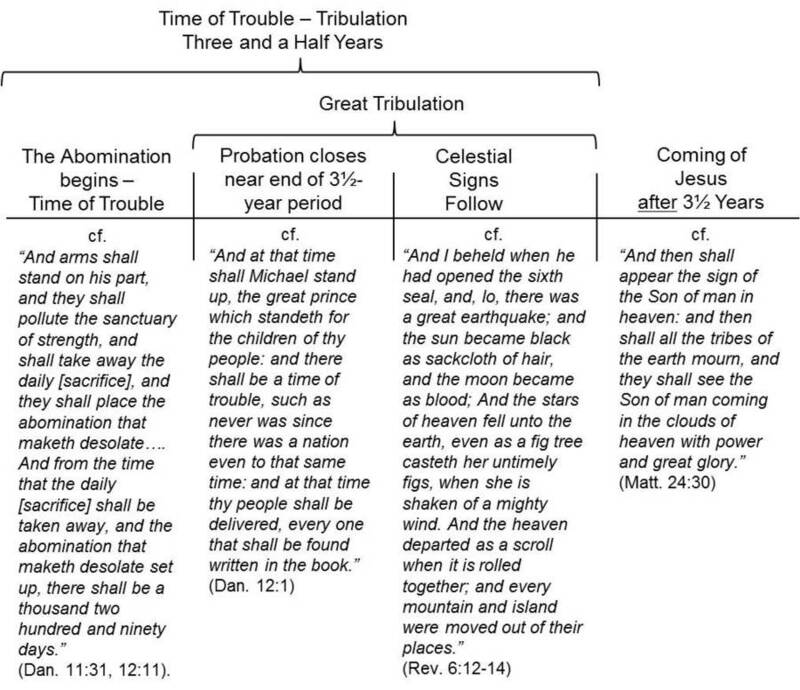 Statistically, we are today in “Tribulation 1”! Jesus said that these signs would become more frequent and more severe (like a lady in labor – Matthew 24 8 – NIV). Before 1978–1980 the number of significant (economic and loss of life) disasters was low, especially those impacting the liability insurance world. This example suggests that we have entered the final “generation” because of increased intensity and frequency (Matthew 24, Mark 13, Luke 21) (more on this later). After Daniel introduced in 12:1 the “time of trouble” or “distress” such as never was, he said that there would be a period of three and a half years of tribulation. “‘It is for a time, times, and half a time [speaking of the final work of the antichrist from Daniel 11]. Then, when the power of the one who shatters the holy people [persecution] has been exhausted, all these things will be finished’” (Daniel 12:7 – NET). “Time” (“moed” – H – a special set-aside time) here refers to a solar year. This is identified as an “appointed time” elsewhere (chapters 8 and 11) and, contextually, refers to the Day of Atonement. Time (one), times (two), half (6 months) = 3½ years. This three-and-a-half-year period is repeated in many ways in prophecy (Daniel 7:25, Revelation 11:2, 12:14, 13:5). Parts 2 and 3 of the graph begin with an “abomination” that Jesus talked about when referencing Daniel in that Olivet discourse (Matthew 24:15; Daniel 12:7, 11-12). In the 1977–1980 period major issues mushroomed into this planet’s history. The Shah of Iran was ousted as revolution hit the streets. By April 1979 a new “Islamic Republic” was in place. Ayatollah Ruhollah Khomeini became its supreme leader, returning from exile. This marked the onset of Islamic moves to infiltrate and “administer” the world. With the fall of Saddam Hussain of Iraq (April 2003), the rise of ISIS in 2004 with Abu Musabal-Zarqawi, the lynching of Muammar Gaddafi in Libya (October 2011) and the Egyptian revolution (January 2011), the checks and balances of power in the Middle East crumbled. Trends show that the1977–1980 window commenced a distinct increase in injury and death from terrorists. In the subsequent move to infiltrate Europe and the United States with immigrants, there has emerged the deepest concern that a stupendous crisis is imminent. The agencies of evil are combining forces. Changes are taking place in this world! A time of tribulation is in its early stages. A “spirit of war” and chaos is everywhere. Of stunning importance, July through August, 2016, Germany, Czech Republic, France, Switzerland, Denmark and Norway began advising its citizens to start stockpiling food and water. Why? A major conflict was anticipated. 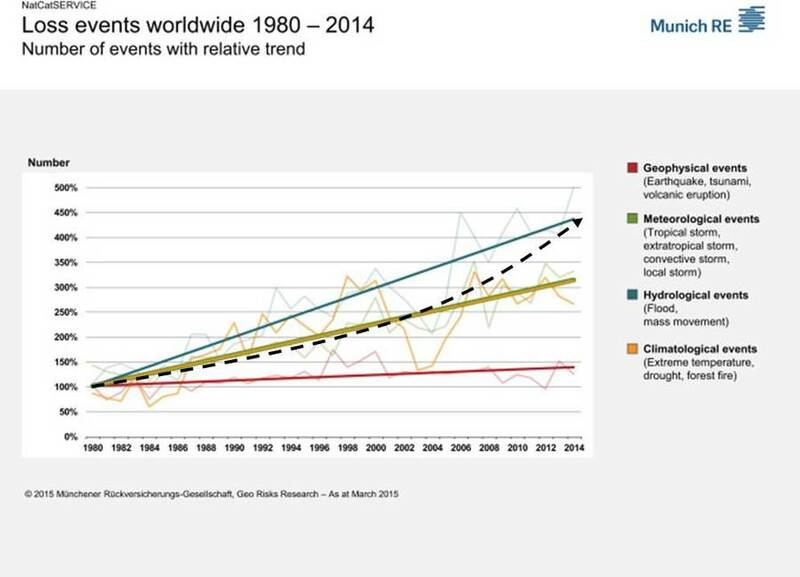 Until the window of 1977–1980, no observable trends in incidence of “significant” calamities were in evidence. This changed during that time period. Once again, it appears that the “final generation” began in the 1977–1980 window. “Satan puts his interpretation upon events, and they think, as he would have them, that the calamities which fill the land are a result of Sundaybreaking. Thinking to appease the wrath of God these influential men make laws enforcing Sunday observance.–10MR 239 (1899).” This is fascinating since a secularized “Christian world” becomes “spiritualized” because of apparent helplessness. Another profound event that still influences the geopolitical world was the inauguration of Pope John Paul II in October of 1978. Under his rule, Euro-Russian communism fell – 1989. He exchanged ambassadors with the United States for the first time – 1982. He urged that a Sunday law be enacted – 1998. He revised the 1917 Code of Canon Law in 1983, adding to the laws of the Roman Catholic Church. “The Church has an innate and proper right to coerce offending members of the Christian faithful by means of penal sanctions….” (Pope John Paul II, Canon 1311). He then added: “The following are to be punished with a just penalty: A person who … teaches a doctrine condemned by the Roman Pontiff.” (Canon 1312). Lest it be misunderstood, the “Christian faithful” included Protestants. They are now called “separated brethren” to mellow the division. These illustrations show that we are standing on the threshold of a world crisis. A “time of sorrows” has begun. This period will be limited to one generation! History is entering its final prophetic end. Christ’s followers will soon give a midnight cry based upon objective eschatological data! This period is the main and initial part of the last three and a half years of earth’s history. At the commencement of this time of trouble, the Holy Spirit will drive God’s two witnesses forward to finish the gospel work. Persecution against His true believers will fill the earth. Converts will come out and endure the persecution. There will be sword, famine, pestilence, and great confusion in the land. The wicked think that God’s chosen had brought the judgments upon them, and they will rise up and take counsel to rid the earth of us, thinking that then the evil will be stopped. The onset of this time begins the Latter Rain experience (cf. Revelation 11:3-7). This is when the “abomination of desolation” (false Sabbath) passes as a legal requirement, defying the true Sabbath (Daniel 12:11). This period is referenced in several ways in Daniel and Revelation. 42 months – this always refers to persecution of God’s people. 1260 days – this is the same time period, but it is when God’s people can count down, just like Noah and the 120 years and the Jews’ 490 years. It is the time of witnessing. Time times half – this refers to solar years and references a judicial period leading to a “day” of judgment. The study of those three and a half years is wonderful and deep, and covers special blocks of prophecy in both Daniel and Revelation. 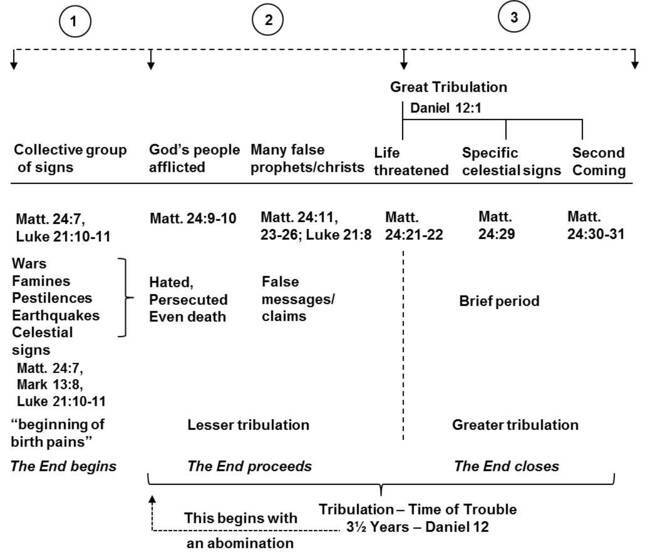 The simplest way to uncover what will occur during this tribulation period is to associate its events in the context of those timing expressions noted here in sequence as they Biblically appear. “He will speak against the Most High and oppress his holy people and try to change the set times and the laws. The holy people will be delivered into his hands for a time, times and half a time” (Daniel 7:25 – NIV). He changes God’s set times and laws. He changes the meaning of the Sabbath and ancient festivals . The antichrist will persecute the saints for three and a half years. “It will be for a time, times and half a time. When the power of the holy people has been finally broken, all these things will be completed” (Daniel 12:7 – NIV). God’s people will be persecuted for three and a half years (Daniel 11:29-45). At the end of this period the work and influence of God’s people will finally be silenced by the antichrist. At the end of that period, history will also come to an end. “But exclude the outer court; do not measure it, because it has been given to the Gentiles. They will trample on the holy city for 42 months” (Revelation 11:2 – NIV). God’s church will be persecuted by the “Gentiles” – those not within His fold. Contextually, by the antichrist – the beast and his minions. “The woman was given the two wings of a great eagle, so that she might fly to the place prepared for her in the wilderness, where she would be taken care of for a time, times and half a time, out of the serpent's reach” (Revelation 12:14 – NIV). God’s church symbolically escapes to a place of protection from Satan (the dragon). Satan tries to exterminate her through a “flood” – symbolic of persecution and devastation (vs 15). God saves the church by neutralizing that “flood” (vs 16). “And I will appoint my two witnesses, and they will prophesy for 1,260 days, clothed in sackcloth.” (Revelation 11:3 – NIV). God’s people are clothed in sackcloth, a loose garment of dark goat’s hair worn when in mourning (examples: Elijah and John the Baptist; cf. II Kings 1:8 and Mark 1:6, respectively). This all occurs during that 1260-day period of witnessing. “The beast was given a mouth to utter proud words and blasphemies and to exercise its authority for forty-two months. It opened its mouth to blaspheme God, and to slander his name and his dwelling place and those who live in heaven. It was given power to wage war against God’s holy people and to conquer them. And it was given authority over every tribe, people, language and nation” (Revelation 13:5-7 – NIV). The antichrist beast again speaks words against the Most High – just as in Daniel 7 – even slandering His name. Wars against God’s people and “conquers” them – silences them (Revelation 11:7). Has world power for 42 months. The antichrist blasphemes God and slanders His name. He changes Gods laws and times – especially related to the Sabbath. Outright war is waged to harm God’s people (persecution – even martyrdom). This covers three and a half years begins, therefore, at its onset when a religious law is made (Daniel 12:11). The church will be preserved! Though it also is attacked. God’s people obey His requirements, have wonderful things to say regarding Jesus and have a broad knowledge base of prophecy so they can witness (Revelation 19:10). It is during this period that the gospel goes to all the world – and the first five of the Seven Trumpets occur. That is another tribulation study. “Immediately after the tribulation of those days shall the sun be darkened, and the moon shall not give her light, and the stars shall fall from heaven, and the powers of the heavens shall be shaken” (Matthew 24:29). This coincides with a similar transition in heaven, revealing additional events. Mercy has ended. God’s wrath is poured out upon the wicked. “And I heard a great voice out of the temple saying to the seven angels, Go your ways, and pour out the vials of the wrath of God upon the earth” (Revelation 16:1). This is also called the “Time of Jacob’s Trouble” (coined in Jeremiah 30:7) and alludes to when Jacob was approaching his brother Esau at the end of his long exile. He knew that his life was in danger (Genesis 32–33). Unarmed, defenseless, and fearful, he took special steps to minimize harm by sending messengers with conciliatory greetings to Esau. He also separated his family into different groups and would meet Esau alone. This was a “little time of trouble” for him. When all alone, he spent the night in prayer. Suddenly he wrestled with “a man” till the break of day (Genesis 32:24). Guilt ridden, fighting for his life, He didn’t think he would survive. When he discovered that “the man” was Jesus, he cried, “I will not let thee go, except thou bless me” (Genesis 32:26b). “And Jacob called the name of the place Peniel: for I have seen God face to face, and my life is preserved” Genesis 32:30). This will be the experience of God’s people during this time. It is a time of supreme stress. Then we will at last see the face of Jesus. We can decipher from Daniel 12’s three timing prophecies that this great tribulation will last 45 days. They have become eternal citizens of the heavenly kingdom! Before he comes, there will be suffering (Luke 9:22, 24; 12:50; 13:32-33; 18:32-33). “… first must he suffer many things, and be rejected of this generation” (Luke 17:25). “They strengthened the souls of the disciples and encouraged them to continue in the faith, saying, ‘We must enter the kingdom of God through many persecutions.’” (Acts 14:22 – NET). Contextually, that suffering becomes the final test that seals our unending allegiance to God. It is the “furnace of affliction,” where the saints come forth more precious than gold (Isaiah 13:12). The apostle Paul, with deep sensitivity into God’s love, projected that final bonding relationship with heaven: “Who shall separate us from the love of Christ? shall tribulation, or distress, or persecution, or famine, or nakedness, or peril, or sword?” (Romans 8:35 – KJV). Our victory is riveted to our faith in Christ’s victory: “These things I have spoken unto you, that in me ye might have peace. In the world ye shall have tribulation: but be of good cheer; I have overcome the world” (John 16:33). One’s irrevocable friendship with Jesus be fully actualized. The cost of pain, loss, suffering and even death will be accepted as “cheap enough” to live with Him forever. Miller, Stephen R.; The New American Commentary, Daniel, vol. 18 (Broadman & Holman Publishers, 1994), p. 315. Garrett, Duane A.; The New American Commentary, Hosea, Joel; (Broadman & Holman Publishers), p. 375. White, Ellen G.; The Review and Herald, November 17, 1910. Fowler, Franklin S., Jr.; Christ’s Introduction to Apocalyptic Prophecy. Fowler, Franklin S., Jr.; Scripture’s Most Important “Time” Prophecies. White, Ellen G.; Prophets and Kings, p. 537; Testimonies, vol. 9, p. 11. White, Ellen G.; Last Day Events, p. 129. White Ellen G.; Christian Experience and Teaching, p. 93 (paraphrased). White, Ellen G.; The Review and Herald, May 27, 1862 (cf. Jeremiah 30:5-7). White, Ellen G.; Our High Calling, p. 321.